I photograph lots of families, but my favorite mama to work with is always this big, beautiful rock we all share. I've been fortunate to explore so many beautiful places with my camera in hand and to be able to share what I find. What I don't share is the many negative impacts we have on our planet, be it liter on mountaintops, smog obscuring skylines, or coral bleaching on the ocean floor. There are a host of small efforts we can make towards preserving and protecting our earth, and I challenge you to add a few (more?) in to your everyday life. Here's a great resource about some ways to reduce your footprint at home, in the office, and on the road - check it out! Despite having slept very little/danced quite a bit the night before, I didn't manage to close my eyes until several hours in to the trip. The first leg of the bus ride was dipping out of the sprawling city - within minutes, we were passing farmland and headed in to mountainous rain forest. Eventually, the winding roads gave way to much flatter terrain, but still equally as engaging. Limon was our first stop, about 4/5 of the way through the entire trip. By now, it was fairly sweltering out, and I was itching to see ocean. The bus station, wherein you pay 150 colone (or about $0.38) to use the restroom. Worth it. Absolutely worth it when it's the first bathroom you've seen in hours. About a jillion miles of banana plants (no, seriously, Costa Rica is one of the world's largest producers of the fruit) and one frog-jumping-through-the-bus-window later, caribbean!! 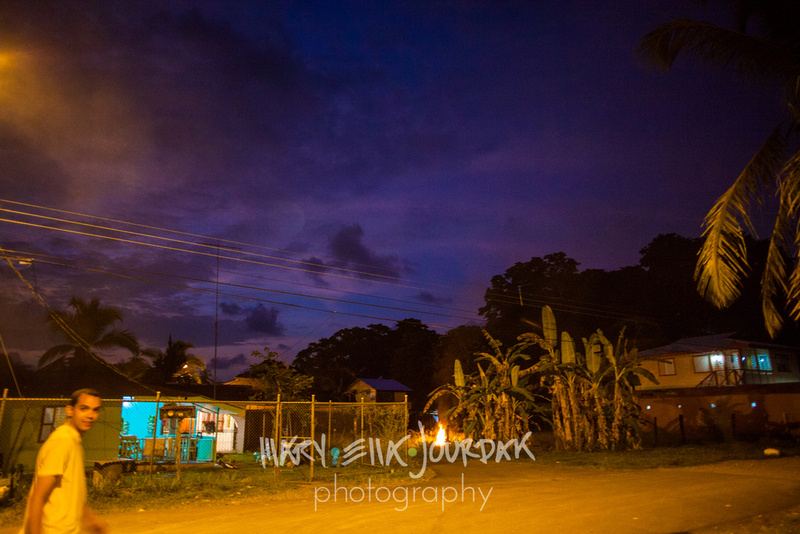 We made it, finally, to our end destination of the little town of Puerto Viejo de Talamanca. ...which was exactly what we did. Ditched everything, camera included, for the night in order to fully embrace the evening - so please excuse the crummy cellphone shots! It could not have been a more perfect introduction to Costa Rican caribbean; toes in the surf while sipping caipirinhas ("one is not enough, two is too many"), watching the sun slowly sink beneath heavy blue-grey clouds, and feeling the night slowly charge Puerto Viejo with a new energy. Quite the way to end the first night in Puerto Viejo! And a quiet and early start the next morning with lush, whispering jungle just feet away from where I laid my head. It's rare to find me awake before 9 a.m. back home, but something about being in a new places has me up with the sun, ready for adventure. Just a few steps outside of the room, a hummingbird flew up just a few inches away from my face to size me up for a long moment, then darted back off in to the canopy. Good morning, indeed! The air is mercifully cool, grey, and wet early in the day here; a busy hum of birds and insects and frogs can be heard until you're a few streets closer to the ocean where waves crashing drown them out. We nestled up in the wild little garden of Cafe Rico for breakfast - a restaurant/coffee roaster/book barter/laundry service/snorkel and bike rental joint. Halfway through devouring a meal served on a banana leaf (fried potatoes, eggs, cabbage, avocados, yumyumyum! 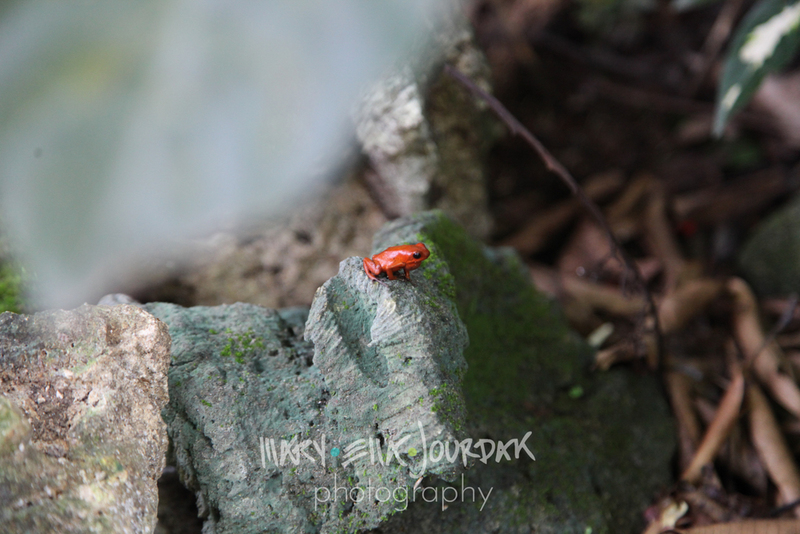 ), we had another 'hey, go check out crazy animals' - this time, it was the little red strawberry dart frogs. Note to self: do not lick paralytic amphibians. I counted about a dozen or so just hopping around on the rocks feet from us, and briefly remembered being a tiny kid with my face pressed to the glass at the National Aquarium in Baltimore seeing these guys for the first time in my life. Important errands call, like introducing ourselves to the local feline population, exploring all ten or so streets that make up Puerto Viejo, getting more colones from the ATM, and beers on the beach/in the ocean. Courageous enough take my DSLR in the water to waist-height after a few beers. Worth it! We took the diplomatic route that morning + afternoon waiting for the sun to come out, which was to buy a cooler full of beer and share it with the other beach-goers. As anyone will tell you, diplomacy is hard work, and the sun started to really cook so we retreated to the shade of Reggae Chill, a bar with beanbags(!!!) overlooking the water. By the way- this day was momentous. Big time. This minute was delicious and unforgettable - my first taste of fresh passionfruit. I think I managed to eat about 20 of these buggers in my time here, had them mixed in to all manor of cocktails, and tried them as glazes/in any food I could. I have been completely hell-bent on finding them at home since my return. Tart and fragrant pulp surrounded crunchy little black seeds, they taste like a mix between kiwi and pineapple. Definitely a new favorite! The lovely lady on the right is Serena - she slings and blends drinks at Reggae Chill, but she was also a super sweet friend during the entire trip with great tips on where to eat and what to do. It was always a treat to walk down the street and see her happy face and bright eyes. Plus, she introduced us to her mother back home in Italy on FaceTime. Ciao mama! Back to beach diplomacy (this time with the local beach dogs), and in to another evening crackling full of Caribbean mystery. That palpable energy I'd sensed the first night was easier to decipher on the second day - some combination of just enough alcohol to pair with spicy and fresh foods to set the head and palate buzzing, being enveloped in velvety shadows and a low, dark sky overhead, the sounds of the surf and night animals clashing with the chatter of a collection of languages and distant music, and the complete unknown prickle of Puerto Viejo itself - a presence that is untamed and awe-inspiring and just a little bit dangerous. We went to Stashus Con Fusion on the last night before they closed up for the slow season. Luckily we did, too, because the mix of cuisine was as varied and beautiful as Puerto Viejo itself - a little somethin' caribbean, asian, Mexican and soul-foody, it was an incredible meal to share with the new friends we'd made that day as well as with my friend Tom (a fellow Kent Islander!) and Nia of Bread and Chocolate. The next day got a slightly later start (something about bottomless mojitos after dinner got us), but it was a gorgeously sunny morning, which makes for an easy bounce back. And fresh coconut water + meat. If that doesn't cure what ails you, you're probably going to die. Fact. Even some of the local little ladies are in on the goodness of coconut, but I think machetes are a bit better to open them with than pavement slams. Ceviche and people/pup watching make for a good lunch, and then we're jumping back in to bathing suits and heading to the beach for snorkeling and exploring. I think I'll quit my job and become a beach dog here. These cuties are so happy and get a ton of love from the beach-goers, and you can't help but smile watching them sprint about and play in the surf. ...and back to Koki Beach. Mainly for the chance of another sloth sighting, but also because they make delicious, frosty cocktails that taste like air conditioning feels. Street barbecue snacks, feline chasing, and passionfruit gin and tonics on the way to Lazlo's Catch of the Day, where what is caught is what is served. I can't say not to fresh seafood! Despite a full platter of fish, late-night empanadas are a serious thing. Apparently swimming and chasing dogs all day can work up a serious appetite? The jungle won. It totally got to me. Playing in the caribbean sun all day, sweating and adventuring and staying in a very hot hotel room with almost no air-circulation had me at super overheat/dehydration levels. This particular morning, I woke up like a strike of lightning, stumbled in to the bathroom and had a spectacular nosebleed. Shoot first, drink water and take a cold shower (or four) second - normal photographer course of action. But no time to feel crummy! There's gallo pinto to eat, morning air to breathe in, and beaches to bike to. 8.5 km away beaches to bike to, actually. Punta Uva to be exact. We passed about thirty thousand spiders in webs high up in the trees, a pack full of howler monkey, and a whole host of gorgeous flora and fauna. How cool are these touch-me-nots? They fold up when you tap the leaves! And finally, Punta Uva! Total postcard perfection with such a towering jungle along the ocean. It was a total blast getting thrown around by the substantially larger waves here. I seem to have picked up a penchant for making grand adventures with (almost) strangers. Sometimes you just spot a kindred spirit and roll with 'em, all while ignoring that voice that sounds oddly like your mother's saying "hey! there is a slight possibility you may end up dead in a ditch for this move!". But I think this is just part of life - listen to your gut, take a little bit of a gamble, and run with it. We live in such a digital age, where face-to-face exchanges are much less common than numbers and photos and emojis that it's kind of refreshing to break from the safety net of texts and e-mails to utterly throw yourself in to a real tactile feet-hitting-pavement adventure. So here we go - in a nutshell, I made a friend in Chicago online who told me to nab my passport and follow him to Costa Rica. We hung out just a few times before I packed up my backpack with snorkel gear and bug spray and (of course) my cameras and headed to DCA for my first trip abroad. A beautiful morning to leave home and get stuck in DC traffic! Fortunately DCA makes for quick check in and it's off to Boston for a VERY delicious layover (lobstah rolls and beeahs, anyone?!). I really loved this spot - the willowy tree, the shock of blue lake, and dandelions EVERYWHERE made me feel rather Seuss-ish. Reubens and beer flights in a speakeasy-turned? Don't mind if I do! Green Door Tavern was super tasty, and they had my favorite watermelon beer on tap. Off to Millennium Park to photograph Lindsay and Josh's pre-wedding portraits. So much fun, and so sweet! I'm so totally enamored with Cloud Gate - it's such a cool piece, and it's a blast to watch people interact with it. A delicious dinner in chinatown, and it's off to sleep - 4 a.m. comes early! O'Hare is pretty damn pretty, I dig this tunnel - ooooh, chromatic ordering. A few pre-flight beers and we were off! Up in the air, and then voila! Five hours later, you're in another world (one with real mountains!). Hello, San Jose! To continue the trend of making grand adventures with almost total strangers, our awesome airbnb hostess invited us to tag along to see a pretty incredible house dj later that night. First, we had to settle in to our digs for the night - a big, comfy room in a 100 year old home-turned-yoga-studio. It was hot and muggy when we landed at the airport, but once we got in to the city, there was a great cool breeze running through constantly. I suppose sitting at 3700 foot elevation helps to keep things tolerable, even at the end of a dry season. Apparently the owners of this gorgeous house went to sand the walls down and discovered multiple layers of paint. A little herb garden in the back courtyard! After we'd settled in, we headed out to explore San Jose a little, with the goal of heading to the central market - intent on devouring ceviche! Finally to the Mercado Central! 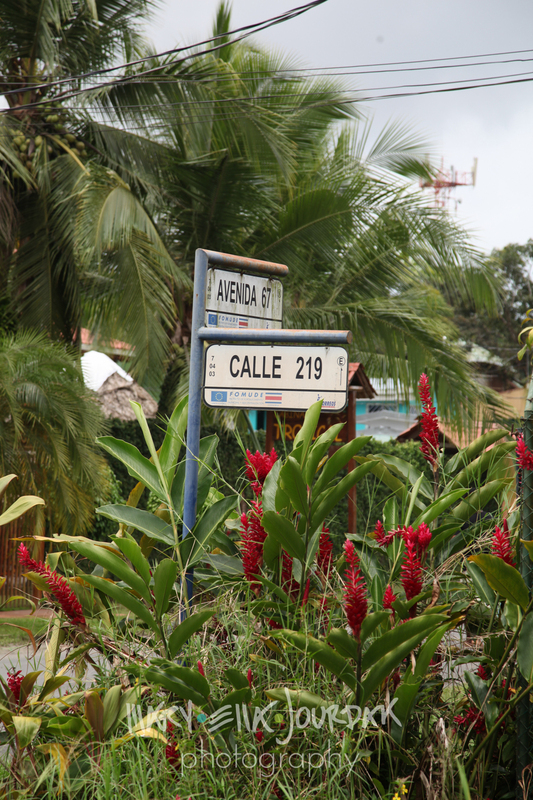 It takes up an entire city block, and is home to over 200 shops selling fruits, vegetables, meats, herbal remedies, clothing, plants - you name it. A rooster in a butcher shop. "Is your meat fresh here?" "Si." The best part are the many little sodas - little shops that sell cheap, quick, and delicious meals. Fiiiiinally, ceviche! A huge bowl of fish, shrimp, mussels, onions, and lime juice. Topped with a hit of mayo and hot sauce, and eaten with boiled bananas (a not sweet, very starchy variety) - delicious! Bottoms up at the little bar inside. Luckily, my travel buddy is fluent in Spanish and spectacular at making friends (my language skills aren't quite good enough to politely ask to photograph people). This gent bought us welcome-to-costa-rica shots. Cheers! Not pictured: dancing from about 11 p.m. to almost 4 a.m. I had a TOTAL blast, but might have been a bit groggy the next morning. Luckily, the bus station we had to be at bright and early had a soda. Gallo pinto will change your life and/or save you from wanting to die from a hangover. Directly translated as spotted rooster, it's a breakfast named for the speckled appearance of rice cooked with beans. I'm quite literally drooling looking at these pictures. One of my favorite meals of the trip!